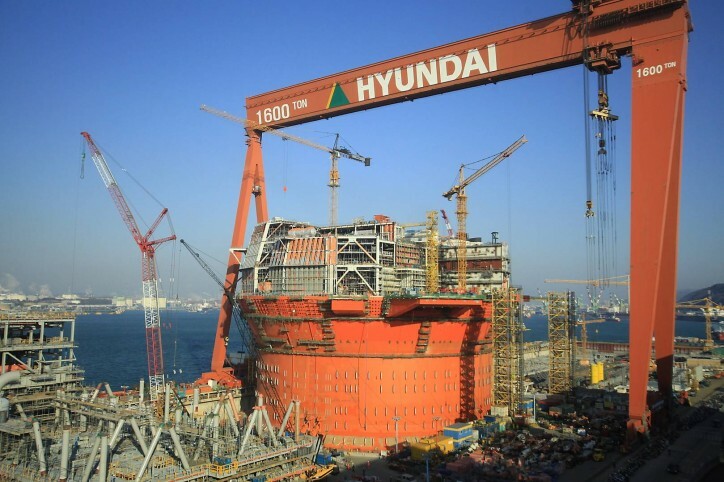 Hyundai Heavy Industries (HHI), the world’s largest shipbuilder, announced that it has signed a memorandum of understanding to collaborate on the localization of main equipment and materials for offshore plants with Doosan Heavy Industries & Construction (DHIC) and Center for Creative Economy & Innovation in Ulsan and Gyeongnam. HHI and DHIC agreed to develop six main items of equipment for offshore plants such as floating, production, storage and offloading (FPSO) units and tension leg platforms (TLP), by sharing engineering and construction technology and prowess in on- and offshore plant sectors where the two companies have been actively played. HHI will apply DHIC’s flagship power technology of gas turbine generators and heat recovery steam generators (HRSG) to its offshore plants, and the two companies will jointly develop metallic materials for offshore floating structures. Since forming a task force team that took on the localization of main equipment in September 2014, HHI has successfully installed onto offshore plants under its yards 38 major items including pressure vessels, air compressors and heat exchangers that local subcontractors developed and manufactured. DHIC also completed the development of ‘low-temperature cast and forged materials for offshore plants’ in 2012 and has been striving to secure technology for the ‘localization of high efficiency large-sized gas turbines’ as the leading company of government’s national research project since 2013.